Vivo V9 is now more affordable at Php 14,990. 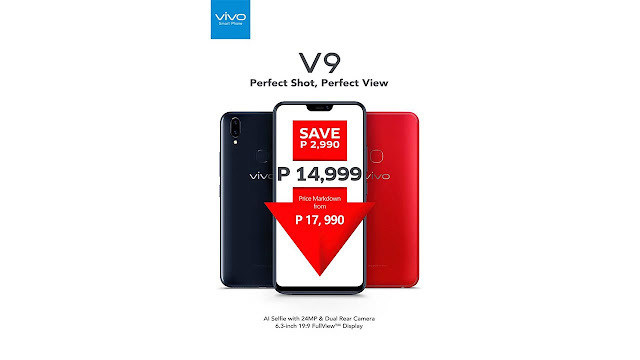 You can now get Vivo V9 for only Php 14990. Vivo is starting the month right with a price-drop of one of its current flagship handsets. This means that purported users can now enjoy flagship-grade features for a more affordable price standpoint. The Vivo V9 is still a great smartphone with 6.3 FullView Display and 19:9 aspect ratio. The handset's deal-maker is the 24MP front camera and 16MP+5MP dual-rear camera. Plus users can have access to great AI-powered features from Vivo's FunTouch OS suite like the High Dynamic Range, AR Stickers, AI Face Beauty, Selfie Lighting, etc. You'll still get the powerful Qualcomm Snapdragon 626 SoC and 4GB of RAM underneath. The Smart Engine and AI Game Mode make the Vivo V9 a reliable gaming machine. Grab your Vivo V9 now in Pearl Black, Gold and Red Velvet configuration.